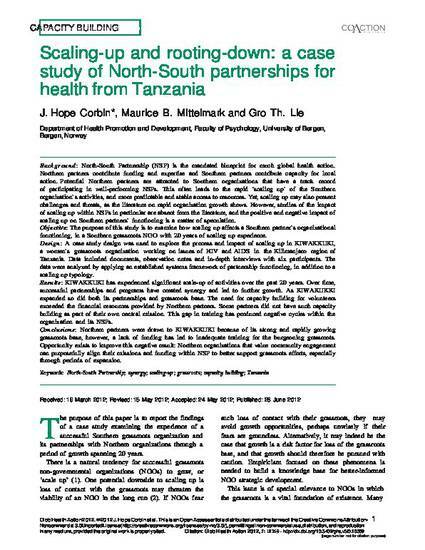 Background: North-South Partnership (NSP) is the mandated blueprint for much global health action. Northern partners contribute funding and expertise and Southern partners contribute capacity for local action. Potential Northern partners are attracted to Southern organizations that have a track record of participating in well-performing NSPs. This often leads to the rapid ‘scaling up’ of the Southern organization’s activities, and more predictable and stable access to resources. Yet, scaling up may also present challenges and threats, as the literature on rapid organization growth shows. However, studies of the impact of scaling up within NSPs in particular are absent from the literature, and the positive and negative impact of scaling up on Southern partners’ functioning is a matter of speculation. Objective: The purpose of this study is to examine how scaling up affects a Southern partner’s organizational functioning, in a Southern grassroots NGO with 20 years of scaling up experience. Design: A case study design was used to explore the process and impact of scaling up in KIWAKKUKI, a women’s grassroots organization working on issues of HIV and AIDS in the Kilimanjaro region of Tanzania. Data included documents, observation notes and in-depth interviews with six participants. The data were analyzed by applying an established systems framework of partnership functioning, in addition to a scaling up typology. Results: KIWAKKUKI has experienced significant scale-up of activities over the past 20 years. Over time, successful partnerships and programs have created synergy and led to further growth. As KIWAKUKKI expanded so did both its partnerships and grassroots base. The need for capacity building for volunteers exceeded the financial resources provided by Northern partners. Some partners did not have such capacity building as part of their own central mission. This gap in training has produced negative cycles within the organization and its NSPs. Conclusions: Northern partners were drawn to KIWAKKUKI because of its strong and rapidly growing grassroots base, however, a lack of funding has led to inadequate training for the burgeoning grassroots. Opportunity exists to improve this negative result: Northern organizations that value community engagement can purposefully align their missions and funding within NSP to better support grassroots efforts, especially through periods of expansion.